The post person came – I got a bill for bunny insurance renewal, Scamp, on the other hand, got sent tasty things to try out again. It seems a little unfair to me, but he thinks it’s great. 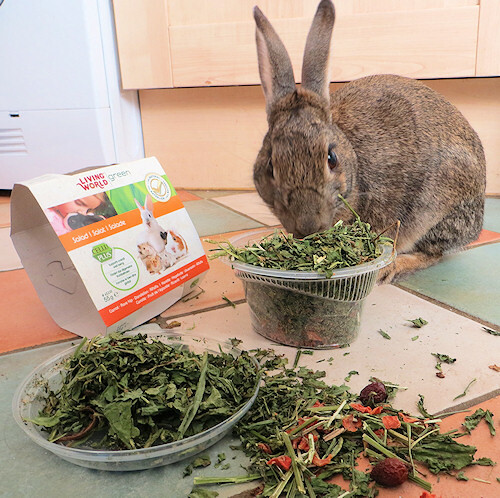 Hagen are launching a new range of ‘salads’ for small animals and wanted guinea pigs, or rather rabbit’s that didn’t mind playing guinea pigs, to taste test them. 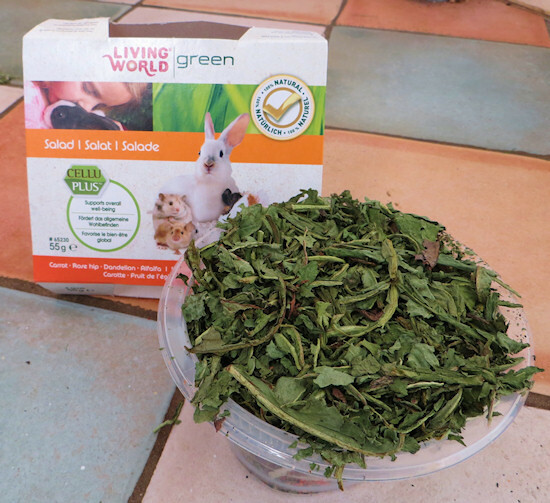 Far superior than common snacks, this scrumptious salad also contains cellulose, a natural plant-derived source of insoluble fibre that is key to your small pet’s health and fitness. With no added sugar, colourants or preservatives, the salad is an excellent complementary pet food for hamsters, mice, gerbils, guinea pigs, degus, rats, chinchillas and rabbits. It can be mixed in a bowl to help satisfy your furry friend’s natural foraging instinct or hand fed. Available in 4 delicious flavours to suit your pet’s needs. I’m not sure if you can make it out in the picture but Scamp got the carrot, rose hip, dandelion and alfalfa variety. 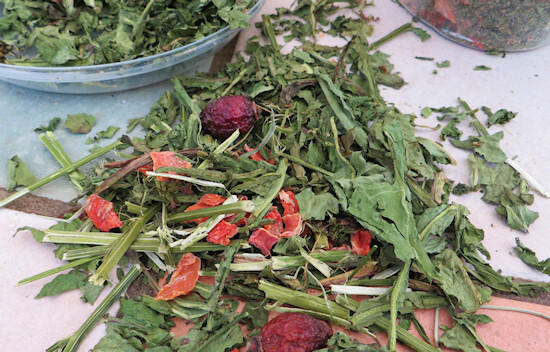 The others include things like strawberry, oat hay, marigold, sunflower and parsley. 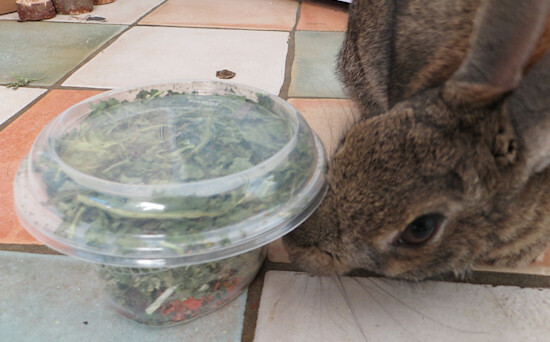 Scamp was very impressed, his nose started going before I got the lid off! And he couldn’t wait to tuck in. He loved the dandelion, alfalfa and carrot bits, but wasn’t entirely sure about the rose hips. They got a good sniff and a chin, so he might be saving them for later. So, all paws up for this. 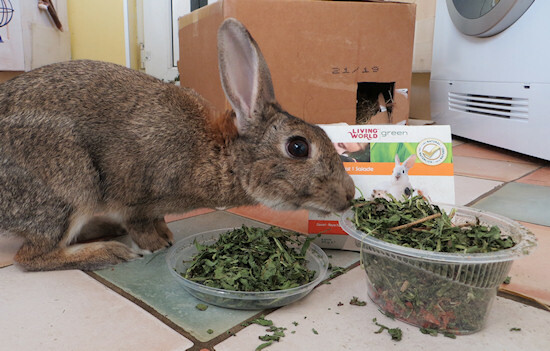 There is a surprising amount of plant in the pot, and it would be great for bunnies with tummies that prefer dried foods to fresh, or aren’t so keen on hay. Judging by Scamp’s reaction it smelled great so it would be good to mix in with hay – it’s also 20% fibre/10% protein/2% fat so very healthy. Brilliant alternative to processed treats! Don’t mind me, I’m just stuffing my face with tasty goodies! This entry was posted on Saturday, May 25th, 2013 at 6:31 pm	and is filed under Product Reviews. You can follow any responses to this entry through the RSS 2.0 feed. You can leave a response, or trackback from your own site. Scamp <3 He radiates how loved he is.. Wonderful to see! I hope he Cleared Up (or Ate Up!) that Mess! Should have given him the Bill for Bunny Insurance and seen what he did with that! He did tidy up afterwards, he’s not bad at hoovering if it’s edible… or sometimes not even that. That’s nothing compared to the mess he can make with 10 minutes alone with a cardboard box or some paper. I can imagine what would happen with the bill… confetti!